For measuring image unsharpness, it is a particularly useful tool for establishing and monitoring the performance of radioscopic (real-time) systems. The CEN standard, EN 13068 makes its use mandatory in certain cases. The IQI consists of 13 wire pairs embedded in rigid plastic. The wires of platinum and tungsten and are exactly spaced to correspond to the diameter of each pair. The degree of unsharpness is indicated by the number of wire pairs that can be seen. As unsharpness increases, the wires merge to form a single image. 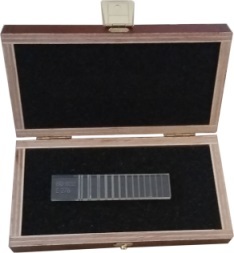 Each IQI is engraved with a unique serial number and is supplied with a Declaration of Conformity together with instructions in a storage box. The EN 462-5 model is an exact replacement for the old BS 3971 model IIIA, itself identical to CERL B. This is the only model of duplex IQI in the EN 462 series.